We offer free local pick-up & delivery, and can wash all types of rugs: new, antique, hooked, braided, tufted, machine-made, hand-knotted as well as all types of fibers: wool, cotton, silk and synthetics. 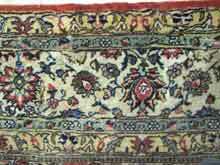 MOTH damage is a very common damage we witness in rugs we receive for cleaning and repair. Moths are insects or pests who love to eat natural fibers made of protein such as wool, silk, or cotton. They are very destructive in the larvae stage and usually the adults are harmless. The life cycle of a moth is roughly between 60 to 90 days. Moths love humid, heated and dark places. Moth damage happens when the rugs are left unclean and undisturbed for a long time under heavy furniture, and beds in places not readily accessible or in storages. Good and clean housekeeping and regular vacuuming is very important in controlling and preventing moth damages to your valuable area, Persian and Oriental rugs. That is why we recommend to our customers to have their rugs professionally cleaned once a year. This is investing in your rugs and preserving them. 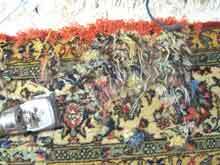 What do we do with moth damaged rugs? 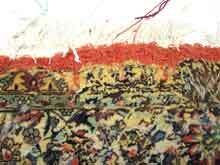 We first expose the face and the back of the rugs to direct sunlight for a few days. After we inspect and make sure that the moths are no longer alive, we vacuum the face and the back of the rug and clean (wash) them with ample water and regular detergent and flat dry them in the sun. Repairing the rug is the next step. To do the repair, we need to make the foundation. This means making warps (vertical threads) and wefts (horizontal threads) on which we can tie the knots around two warps. This is a very highly specialized job done by our master repair personnel on site as they have to match the weave while considering the knot technique to be the same as the entire rug. Matching color of the new weave and matching the design is another delicate part of the repair. 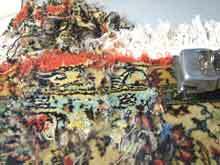 It is an art by itself to repair a moth damaged rug. We treat your rugs like they were our own.